Ben Kaiser is originally from the Midwest, where he began his career in architecture and construction as a carpenter’s assistant in Cleveland, Ohio. Ben went on to attend the Rhode Island School of Design, where he earned a Bachelor of Architecture Degree and his B.F.A. Alongside his studies, he continued on in the construction trades as well. He became a registered architect in 1992 and moved to Portland a year later. 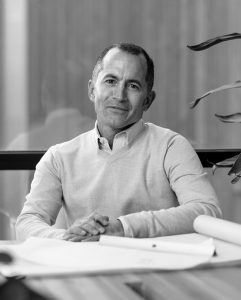 Ben is owner and principal of Kaiser Group, Inc. and PATH Architecture, Inc. Kaiser Group was founded in 2000 in Portland, with a focus on commercial and residential renovation and new construction. PATH followed in 2005, committed to offering the highest level of conceptual design and to creating timeless modern works of lasting value. Both PATH and Kaiser Group have received numerous awards from the American Institute of Architects and governmental entities for projects completed. Both firms stress the importance of sustainability in design and construction. Ben currently sits on the Portland Design Commission, which is tasked with overseeing the myriad of zoning, design, and planning issues within the City of Portland. Kaiser Group, Inc. is a development firm with over 20 years of experience in all phases of real estate development. We help our clients navigate the myriad and complex issues involved in the design and construction of new structures for their business development, for an investment opportunity, or for building their own home. We start with a client’s vision and budget, work next with land assessment and acquisition, then proceed with space planning and design considerations. Paralleling these initial phases, we also serve the client by helping to secure funding resources, whether through private banking, institutional banking, and/or local and state resources. A project’s original vision, its budget, and the funding resources are all imperative components in the design and construction of a new (or renovated) structure. These three critical aspects all need to be consistently well-balanced by the assembled team to achieve a project’s successful completion. Kaiser Group will create and maintain that balance. For a project’s pro forma to be effectively created, all of the budgetary numbers involved in the project must be presented and aligned, from the original land purchase price to the resultant lease rates. From the onset, the budget needs to be considered and accurate — when a project falls off track financially, a successful idea can quickly become a problem for the owners. Kaiser Group works from proven experience to manage the team and the budget, and to ensure each project adheres to its original vision. Once a project is complete, we offer services to support our clients with leasing and sales of the property. Our team has years of experience in both residential and commercial condominium sales as well as with leasing and management of residential and commercial spaces. We have also assisted our clients in relocations, tenant improvements, and projects of varying scopes in between. Kaiser Group’s goal is to work with you to determine just the right approach to your project, and then to take that approach and that foundation of client-firm relationship into all aspects of the project’s development and success. Whether it’s new construction, a full-range renovation, or a smaller scale project, modernizing an outdated structure to fit new needs or codes, or developing an entirely new property with a unique vision and focus, our team is here to serve you with proven experience, steadfast dedication, and a passion for development. Ten feet above a backyard in a residential neighborhood in Portland, this artist’s studio/yoga space/guesthouse conjures up thoughts of a childhood tree house. The entrance to the unit is via an exterior staircase. Floor to ceiling windows on the east and south walls frame views of the tree canopy surrounding the property. Dappled morning light floods the space in the early hours of the day, and as the sun moves overhead, light is reflected throughout the space from the private, outdoor spa below. The primary intention of this project was to create a versatile space for the client that could be used as a guesthouse, an apartment, an artist’s space, or a yoga studio. With a straightforward structural design, the building’s beauty is due to the high attention to detail, materials, placement of windows and doors, and expert craftsmanship. 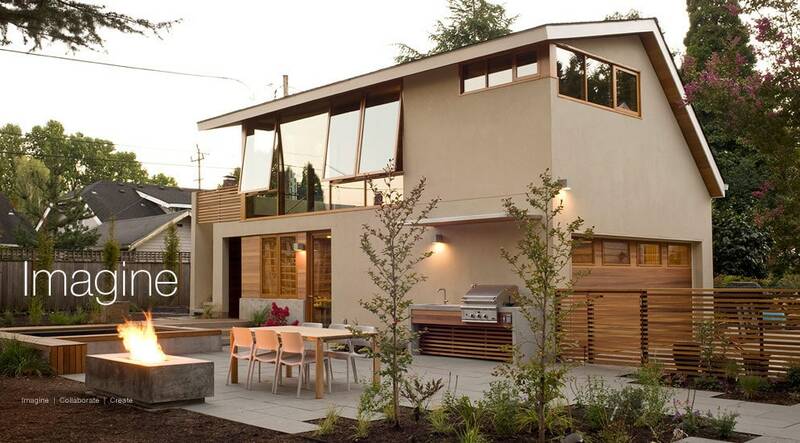 An efficient use of existing and potential space, consideration of changing natural light conditions, and creating a central connection to the backyard, together with the City of Portland’s accessory dwelling unit (ADU) design standards, helped shape the structure’s design. The building features a modest façade and ample eaves. Its form blends well with the existing style and scale of the urban neighborhood. As the user moves from the main house or the busy street outside into the backyard, the restrained structure of the garage and studio building seems to open, capturing the east light and establishing the strong connection to the modern landscaped outdoor space. This outdoor living room connects the main house to the studio and is intended to be enjoyed year-round, with a sauna/shower, fire pit, in-ground spa, and an outdoor kitchen. Despite the intentional open connection between these three spaces, the ADU is designed to provide the user complete privacy if desired.